Clever Crow caught something in his beak today – Mercury! Image courtesy BS Thurner Hof. The raven sees; the raven saw; and in the corn he sayeth “cah”. LOL, the crows are yammering in the background as I write, believe it or not…! Mercury is currently conjunct the star Alchita in the constellation of Covus; A.K.A. 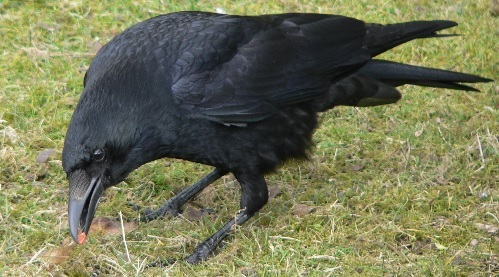 the Raven or Crow as known by its more common nomenclature. More precisely, this star is located in the vicinity of its beak – with that in mind, what has a little birdie told YOU lately? Now may be a time to listen intently, because we might even unearth a Word Of Power or two hidden in a conversation. What key things speak to us now? Perhaps with Mercury also square Pluto, minute, almost imperceptible things such as body language, tone, or phrasing may be the most telling. Perhaps it’s not words at all, but something symbolic that piques our interest and speaks deafeningly to us like some kind of ultrasonic call only our acutely attuned ears pick up; an omen or sign of some sort…crows are magical as they are often witches’ familiars, after all! I find that I am prone to seeing portents all the time, especially from birds. I’m freakishly attuned to my avian friends and do have many wild stories about Cool Encounters of the Winged Kind. There’s the vultures, the whopping total of 10 feathers recently gifted to me by the doves during Venus Retrograde, the incident a few weeks back where I was walking under a stand of walnut trees and listening with delight to a buzzy little bluebird tittering in the boughs above me when he floated a beautiful azure feather down to me – it was quite magical! Finding feathers is also supposedly a sign of angelic presence, FWIW. So if you come across a random feather, look twice because there may be a message there for you! If you can, try to I.D. the species and then perform an internet search for the symbolism of that particular bird. I realize that not everyone is a nature nerd like Yours Truly, LOL, so if you’re not able to identify the genus it came from, no worries there – you can always look up just the symbolism of the color itself. But this is an example of how messages don’t always require words, and with a retrograde Mercury on Alchita, I think this is something certainly worth pondering. From a more esoteric standpoint, one other thing I want to mention is Mercury on this particular star makes me think it could be a good time to connect to our throat chakra and do a little scan to see if this energy center is either blocked or, conversely, overactive. Let’s speak our Truth…or just plain speak up, period! Do we have something to crow about? If so, let it fly! On the opposite side of the coin, have we been jabbering on noisily? Do we need to moderate our loquacious ways by closing our bills a bit? Perhaps we would be better served by giving our beaks a more concerted focus! Mercury in Libra loves a mindset of “All things in moderation”, so perhaps Alchita’s cawing is just a reminder to keep the yin/yang balance….